Continuing a tradition of repackaged relics across the sports and entertainment worlds, 2016 Leaf Memorabilia Treasury features a varied product that focuses on quality collectibles. Offering a lower price point, each box promises five memorabilia pieces. 2016 Leaf Memorabilia Treasury features both signed and unsigned collectibles, including top athletes, entertainers, personalities, musicians and stars of Hollywood. The relics will cover a wide array of choices, including various autographs, but specific pieces include game-used memorabilia, entertainment-worn memorabilia, and awards, trophies and high school yearbooks for celebrities. 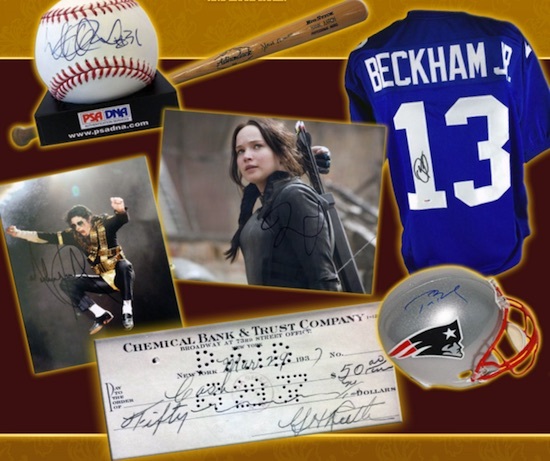 The sell sheet highlighted such items as an Odell Beckham Jr. signed jersey, Michael Jackson signed photo, Tom Brady signed helmet, Ichiro signed baseball, Jennifer Lawrence signed photo, Hank Aaron signed bat and a voided check signed by Babe Ruth. Leaf always packages products with the collector in mind. Other companies only do this with their own profits in mind. Leaf gets my money each and every time as the value is always at or above the price of the product. Got a great deal on a box of this…hits were fun if not spectacular. An auto album cover from Aerosmith, Drexler and Gooden auto jerseys, mini-helmet (forgot who) and auto 16X20 photo of Olympian Jones. Fun product, but definitely pricey. Still, along the way I’ll probably spend an equal amount on Topps regular Series 2–and have a bunch of single color patches, obscure prospect autos, and repetitive inserts. I am growing to appreciate products like Leaf Treasury more–there are hits, the potential for big hit is a bit, and mediocre hits are much better what you get from 6 jumbo Series 2 boxes.